You'll never go back to an old-skool analog mixer once you've used StudioLive™. With its incredible signal-processing power on every channel, easy store and recall of every setting, and the ability to record it all with just two mouse clicks, you'll get spoiled fast! Easier to use, better sounding, and flawlessly integrated with state-of-the-art software, it delivers the most creative environment possible for both live performance and studio music production. The StudioLive 24.4.2 is a fine choice for those who want to mix small to medium-sized shows and worship services, and it's a great choice for club systems, corporate applications, and educational institutions. And it's the perfect hardware core for a project studio. 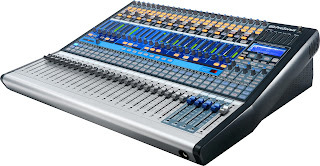 Or daisy-chain two StudioLive 24.4.2s to form a 48x4x2 performance console for mid-sized shows and events. Here, in one device, are high-headroom XMAX™ microphone preamplifiers, a built-in FireWire recording and playback interface, more than 90 signal processors, a big library of DSP effects, 10 aux buses, 4 subgroups, extensive LED metering, mixer save and recall, channel-strip save/recall/copy/paste, talkback, and more. Yet despite its many controls and features, it's compact and easy to transport. Build live mixes that glisten with clarity and detail—then record and enhance the performance with the power of StudioLive 24.4.2. Get creative in the studio. Build mixes, loops, sound effects, and more, then bring them out to your show and mix them with the live performance. Process channels using your favorite plug-ins and completely automate your entire performance. StudioLive 24.4.2 revolutionizes music production, opening endless creative possibilities. ↓ Read more about the StudioLive’s analog-like ease-of-use. Despite its analog-like mixing surface, this is very much a digital console, and it offers features no analog mixer—and very few digital boards—can match. For example, the ability to control the StudioLive mixer from a laptop adds tremendous flexibility and convenience—and with the bundled Virtual StudioLive bidirectional control/editor/librarian software, you get it all for free. You can say goodbye to that problem if you use a StudioLive 24.4.2 and an Apple iPad®! With StudioLive Remote for iPad—available free from the Apple App Store—you have complete, real-time, wireless remote control over Virtual StudioLive, which in turn offers real-time control over the StudioLive mixer. As long as you have a wireless connection between your iPad and computer (and are connected via FireWire to the 24.4.2), you are in control of the console. StudioLive Remote is easy to use, provides control of almost every feature of the StudioLive, and looks and feels like an iPad app should. The level of control you get with PreSonus StudioLive-series mixers is beyond cool—it's absolutely ice! Now you can control your sound from anywhere you choose—no limits! Only with PreSonus StudioLive. ↓ Read more: Fat Channel signal processing and effects. ↓ Read more: A complete listing of effects presets. The StudioLive 24.4.2's 4 dual, 31-band graphic equalizers can be applied to the main, subgroup, and aux outputs so you can compensate for room acoustics, speaker response, and much more. Furthermore, with Smaart Measurement Technology™, you'll be able to really put StudioLive's graphic EQ to work improving the sound of your P.A. Precisely identify nasty feedback frequencies. Get your loudspeakers to play nicer with the room they're in — all without having a degree in acoustical engineering. ↓ Read more: Store and recall made easy. ↓ Read more: Sample list of channel presets. If you have a computer with 6-pin FireWire, you have a 26-track digital recorder instantly ready to capture your gig, church service, or presentation. That’s because StudioLive 24.4.2 features a tightly integrated FireWire interface that delivers up to 32 channels of recording and up to 26 channels of simultaneous playback. Each FireWire recording channel can be set to record either pre- or post-Fat Channel signal processing, delivering total flexibility and power. Just two mouse clicks engages Capture™ recording software. When you install it on your laptop, it automatically “maps” to the outputs of the 24.4.2 to automatically record all 24 input channels. Studio One is a groundbreaking music-creation and -production application for Mac OS X and Windows® that makes audio recording and MIDI sequencing ridiculously simple right out of the box. Studio One changes the rules of the game with fresh code, innovative drag-and-drop features, advanced MIDI mapping, auto-configuration with your StudioLive 24.4.2, insanely good audio quality, unlimited tracks and plug-ins per track, and a powerful, inventive Start page. Studio One Artist also comes with a Native Effects™ 32-bit effects library, complete with dynamics processors, reverbs, modulation effects, amp simulators, and more. And with Studio One's free Nimbit® extension, you can immediately start selling your music. XMAX™ Class A preamplifiers deliver more headroom, deeper lows, smoother highs, and a richer overall sound than the preamps found in competing mixers. 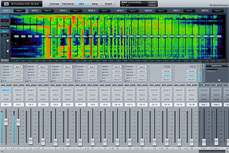 Ultra-high-headroom, 32-bit floating-point processing is used for all digital mixing. All analog inputs and outputs use the highest quality digital converters available. Synchronization to your computer is stable and robust, thanks to JetPLL™ synchronization technology, resulting in great stereo separation and clear, transparent audio. ↓ Read more about A/D/A and Jet PLL. Why choose the StudioLive 24.4.2 rather than the StudioLive 16.4.2? Let's say you want more than 16 channels but want to keep your system compact. Perhaps the acts and events you mix require lots of monitor mixes, so you need more than the six auxiliary buses in the 16.4.2, and you want fully parametric EQ, rather than semi-parametric. You could use an enhanced gate with Key Listen and Key Filter features, and a Threshold control on the limiter would be handy. A stereo graphic EQ on the mains is mandatory but you also want graphic EQ on the subgroups and auxes at times—four dual-mono, 31-band graphic EQs would do the job nicely. No problem! You get all of these enhancements and more with the 24-channel, 10-aux, StudioLive 24.4.2. If your needs and budget are more modest, you might want to consider the StudioLive 16.0.2. The StudioLive 16.0.2 provides fewer channels, mic preamps, aux buses, FireWire streams, graphic EQs, and meters than the StudioLive 24.4.2, and it does not have subgroups, digital outs and analog direct outs. Its faders are 60 mm instead of 100 mm, and you can't daisy-chain two 16.0.2s to create a larger system. And the StudioLive 16.0.2's Fat Channel is less elaborate than the 24.4.2 Fat Channel. However, the StudioLive 16.0.2 is much lighter and more compact than the 24.4.2, it's considerably less expensive, and it has a very cool feature that the larger StudioLives don't offer: MIDI control over main output level, effects levels and routing, and Scene change. We've provided plenty of written material about StudioLive. In addition, you can go to the Video tab on the upper section of this page and watch a whole series of instructional videos showing StudioLive mixers in church, club, and project-studio applications. Video blogs go into detail about various powerful StudioLive features. And we regularly add new videos. 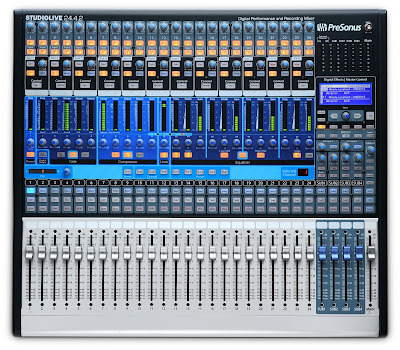 Reading about the StudioLive 24.4.2 is a good start but nothing beats actually getting your hands on one, so visit your nearest PreSonus dealer today. 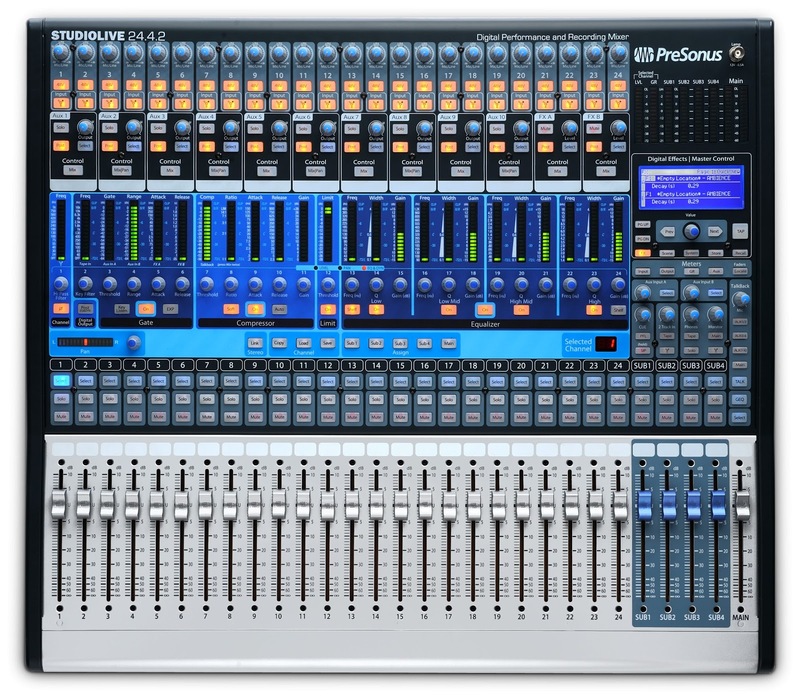 Use our Where to Buy section to locate your nearest PreSonus dealer. You'll see what we mean about intuitive ease-of-use. You'll hear what we mean about Class A preamps, rich DSP effects, and overall sound quality. And when you have seen and heard it for yourself, you'll understand why your new mixer should be a StudioLive—the most exciting small-format digital mixer on the planet. We've begun to incorporate Rational Acoustics' highly regarded Smaart Measurement Technology™ directly into our Virtual StudioLive™ remote-control/editor/librarian software for StudioLive™ mixers. ↓ Read more: What is Smaart? Now you can really put StudioLive's graphic EQ to work improving the sound of your P.A. Precisely identify nasty feedback frequencies. Get your loudspeakers to play nicer with the room they're in — all without having a degree in acoustical engineering. VSL’s Smaart implementation is accessible and intuitive, so that inexperienced users can make basic adjustments to the system, and experienced users can adjust the system quickly and precisely. See the spectral content of your mix in real time. Then do something about it. When you click on the Graphic Equalizer button in Universal Control 1.6, Smaart Spectra’s Spectrograph and real-time analyzer algorithms go to work, showing you the spectral content of whatever is routed though a particular graphic EQ. You can also activate a real-time analyzer, much like the Studio One™ 2 plug-in, and view what you are hearing. Can’t tell if your mix has too much low end or your room is boomy? Use the RTA to see where your mix has gone awry and clean it up! But the real magic is Smaart's unique Spectrogram display. The Smaart Spectra Spectrogram shows level versus frequency versus time. It graphs a continuous series of Spectrum measurements with frequency on one axis, time on another, and level indicated by colors. The display responds in real time as you adjust the graphic EQ. ↓ Read more about the Smaart Spectrogram. All the advantages of VSL, too! Because Smaart is integrated into VSL, its features can be wirelessly remote-controlled using StudioLive Remote 1.3 or later for iPad® — a free download from the Apple App Store. You can even use third-party VPN software to remote-control VSL, and therefore, Smaart, over the Internet—so contractors can help solve clients’ sonic emergencies without being physically present. This is just the start of a beautiful relationship with Rational Acoustics — PreSonus products are about to get a lot Smaarter! All settings can be copied among channels and saved as user presets.